Tomorrow is Thanksgiving and I am so excited to be home with my family! This is one of my favorite holidays, although I always feel a little conflicted celebrating when we as a greater society continue to overlook Indigenous rights. But on the other side, I’m beyond grateful to have my grandmother with us for another Thanksgiving—she’s become very ill recently, and nothing is more important to me right now than spending quality time with her. And if you follow me, you already know my entire brand, energy, and life’s foundation is based on practicing GRATITUDE! So Thanksgiving really is a personal favorite holiday for me because I like to think that for one day a year, everyone else is collectively feeling and appreciating our daily blessings. We truly our blessed. If you are reading this, you are in the one percent. Don’t ever forget that. I want to share with you a global impact designer I’ve been crushing on lately: Arteaga. This stunning, luxury brand combines heritage techniques and sustainable practices making it an A+ in my book. Their studio is based in Brooklyn, but they work with artisans around the world, including in places like Rajasthan, India. Why is this important? Because when brands such as Arteaga work with local artisans, they provide fair jobs—fair in practice, fair in income. The artisans are able to provide for their families, and by using heritage techniques, allow cultural traditions to live and get passed on. Isn’t that so beautiful?! I just love conscious fashion so much! 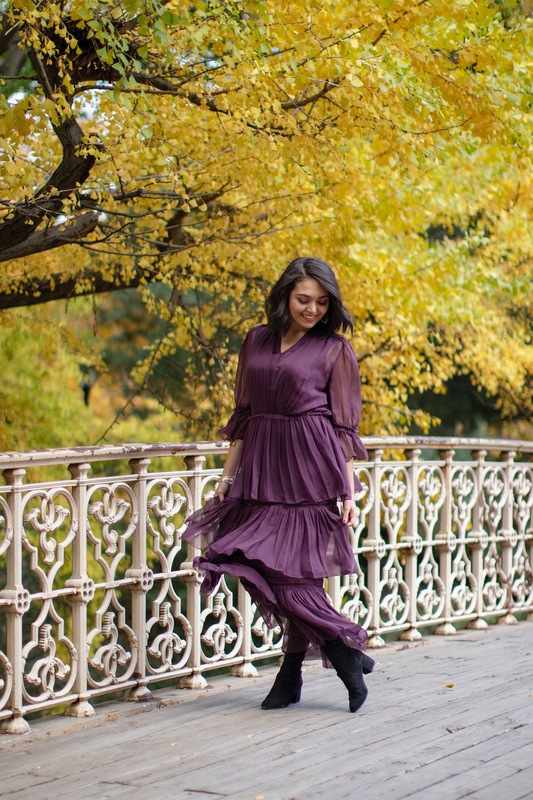 This beautiful aubergine piece is one of my favorite dresses ever. I’m a sucker for maxi dresses in general, especially in the cold weather. I can throw some OTK boots under them like I did here, and still stay warm without giving into jeans. This sustainably designed dress is so luxuriously soft and comfortable, and it just dances on its own with all those lawyers, I couldn’t help twirling in it! I’m very grateful to Arteaga for lending me this dress last week for a segment I was asked to speak on for Fox 5 NY as a SUSTAINABLE STYLE EXPERT! A few years ago I invested all of my money into hiring media trainers and agents and managers for just one chance to speak about sustainable style on a segment anywhere. After they took all my money (literally my savings because I was so confident in betting on myself) they told me, “You’re not what they’re looking for.” I knew exactly what they meant. No one wants to try and pronounce my name, my thick brows and Middle Eastern features don’t fit the mold, and no one cares about conscious fashion. I refused to believe that. Instead, I continued to spread my message through my own platforms and in the end, I was scouted through Instagram! 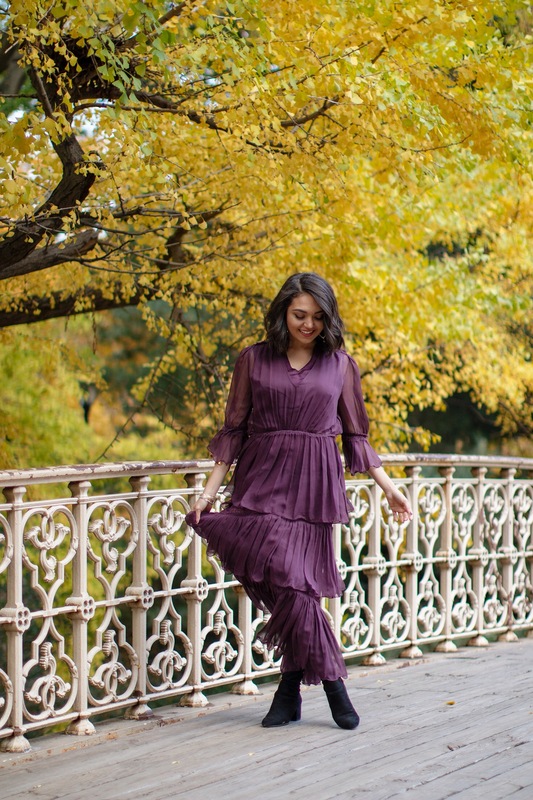 If you notice, I’m twirling across a bridge in Central Park in these photos. I like to think this symbolizes other bridges I’m currently crossing in life, hopefully with the same grace and happiness pictured here! Wishing you all a beautiful holiday!